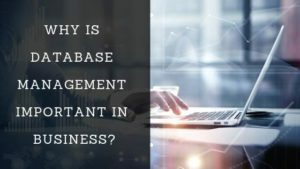 Home Online Business Why is Database Management Important in Business? Database Management is a SQL based information management system. This digital management of your database helps you with easy management of the records and information. You do not have to struggle much to search the old records through your office registers and waste several hours in productivity. With Database Management everything is just a few clicks away. You can store the information, fetch out the data of previous years and organize your data in the most effective manner. Now, you would wonder how company information database is important for the growth and development of your business? So, the answer is there is not just one but numerous benefits for your growing business. Let us check the most important ones. Your employees now don’t need to browse piles of documentation files to search a single query. Even after spending hours on the data search there is no surety that you can find the relevant information. However, with database management, you can find the oldest as well as the most recent information within seconds. The management of data in papers and files can lead to loss of your confidential data. The files can be simply lost, damaged and even stolen. With Database Management you can secure your data with password protection and give access to only important officials. You can maintain the records of your past as well as present clients. It will be profitable for your business. You can approach your clients whenever required. To account your growth every year, you must have the sales data of the previous year for comparison. When you have all the information about the profit or loss and sales every year, you can calculate if you are progressing or not. You can easily estimate the growth rate of your company. You don’t have to hire a number of employees for the maintenance of records. It can be done easily with the help of Database Management Software. A single software can account for the work of ten employees. You can organise and manage the data very efficiently at a lower cost. Updating the old records maintained manually is not possible you have to put all the efforts to recreate everything. With Database Management you can update the old data within no time and comparatively fewer efforts. With RDBMS it is possible to save the data relatively. Connect the information in two different columns or tables very easily. For eg: you can maintain the records of employees, their attendance, number of leaves, their salary, hike each year, performance and much more. You can maintain a record of each employee and compare all to know the best performer. This is just a single case. There are many aspects of an organisation where the Relational Database Management make your work operations smoother. For the efficient working of the company, we require speed, cost-effectiveness, accuracy and easy access to past records to plan for improved future goals. Database Management is a single tool that accounts for business essentials. You can update the record of each second and also track them which allows your employees to work productively. This method is tried and tested for best organisational management.